For listeners who love their beats and want to keep things wired, the Beats urBeats3 earbuds are an affordable option relative to the rest of the company's lineup. The flat cable effectively combats excessive tangling while the magnetic housings keep things fairly neat when the 'buds aren't in use. Sound quality isn't remarkable but the bass response is fairly subdued compared to what we've come to expect with Beats products. Seeing as the Samsung Galaxy S10 retains the headphone jack, this gives wired earbuds and headphones a bit more breathing room. The Beats urBeats3 is a fashionable option for listeners with a death grip on wired audio. While the urBeats3 is one of the company’s more affordable products, listeners are still paying a premium for the Beats name. Who are the urBeats3 for? No matter what ear tips I tried, the urBeats3 came loose. These wired earbuds are for anyone and feature a more subtle footprint relative to other Beats products. The angled nozzles make longer listening sessions comfortable, and the tangle-resistant cable is nice for those moments the ‘buds are mindlessly tossed into a bag. You can get away with lightly exercising in these but be wary of any intense workouts as the urBeats3 ‘buds aren’t IP certified. The 3.5mm plug is met with a hard plastic and silicone stress reliever. 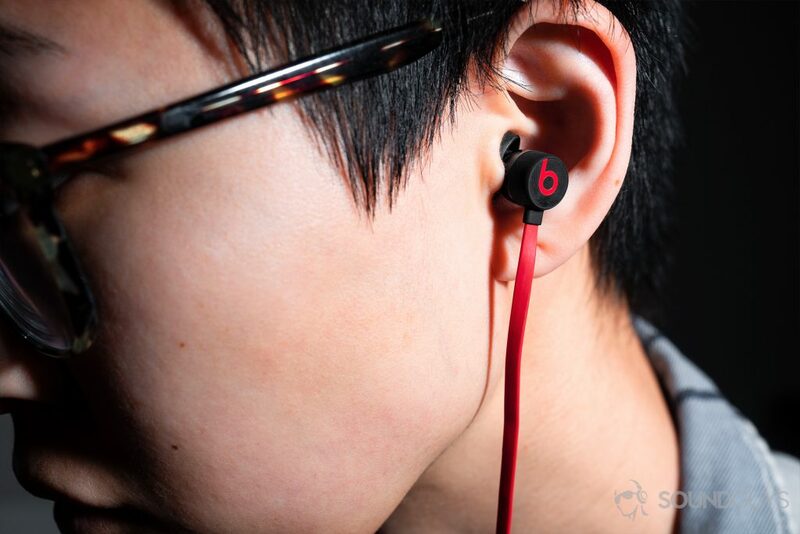 The signature Beats red flat cable effectively resists tangling but doesn’t completely neutralize them. However, if the cable does happen to tie itself into a knot, it’s easy to undo. Halfway up the ribbon cable is a black Y-split where it diverges into two parts. When out and about, the lack of cable management is frustrating. During testing, I ran the wire under my shirt to prevent it from catching on clothes or my backpack. Both housings have a bullet-esque build and are brandished with the recognizable lower-case “b.” Inside each chamber is a dynamic driver that pumps sound out through the angled nozzle and into the ear canal. The ergonomic design is comfortable. Unfortunately, though, none of the included ear tips fit my ears well, resulting in an unstable fit. If you run into the same issue, be sure to peruse some third-party ear tip options. Android users are unable to control volume via the in-line remote. Down the left line sits an integrated mic and three-button remote module, which feels cheap relative that of the BeatsX. Listeners may use it to control playback and take calls. If you have an Android phone, volume controls won’t work. On the flipside, Android users can access Google Assistant without issue. The magnetic housings are nice but don’t make up for the lack of a sliding management system. Microphone quality is a pleasant surprise. My voice was only slightly muffled when speaking with friends, and the microphone placement effectively negates any potential noises from head-bobbing. Background noises are slightly diminished, but if a car revs its engine by you, it’ll be relayed to your speaking partner. The Beats urBeats3 integrated control module feels cheap, but the microphone quality is surprisingly good. Since these are wired earbuds, you don’t have to keep your eyes peeled for high-quality Bluetooth codecs. That said, listening will be a more enjoyable process if your phone has a native headphone jack rather than requiring a USB-C dongle adapter. The actual plug is gold-plated and feels sturdy enough, but an L-shaped jack is preferred. Low-end frequencies receive more emphasis than vocals, but sound reproduction stays fairly neutral for Beats. If you can get a proper fit, the earbuds effectively insulate you from your surroundings. While the frequency response is more neutral-leaning than I anticipated from Beats, clarity is deficient. Even in my quiet apartment with the earbuds jammed down my ear canals, detail is just ok. Generally speaking, bass is still the most prominent characteristic of the urBeats3 sound signature. To get the strongest bass response, make sure the ear tips form a cogent seal as this also promotes better isolation. The Y-split offers a fair amount of flex while remaining sturdy. Gregory Alan Isakov’s song Chemicals begins with a solo guitar alternating between C-F chords with light piano playing to underscore it. Even without vocals or the secondary guitar, which enters later, the guitar’s clarity is lackluster. Listen for the F chord at 0:03, the harmonic resonance is hardly audible over the piano which, again, is just accompaniment and is not being played powerfully. At 0:55 the first cymbal hit and kick drum are heard. The former is incredibly difficult to hear with the urBeats3 and may even be missed if you’re not actively listening for it since it’s masked by the kick drum, which isn’t meant to be overwhelming yet sounds that way due to the sloppy audio reproduction. Sound quality isn’t all negative, though; Isakov’s voice is reproduced surprisingly well particularly the when his register goes low at the last utterance of “gone” in the song’s final moments. Generally speaking, if you’re a general consumer who isn’t too concerned about sound quality the urBeats3 are fine, but if you’re a discriminant listener, they won’t do. Should you buy the Beats urBeats3? For just under $60, the Beats urBeats3 is one of the most affordable products the company offers. Most people know in an instance how they feel about Beats; the company knows how to elicit a visceral reaction—positive or negative. Rather than try to sway you in one direction or the other, I’ll be straight with you: the urBeats3 isn’t a great deal for the price. Listeners aren’t afforded accessories aside from two additional pairs of ear tips, and sound quality is little more than mediocre. That said, we consumers don’t typically buy Beats for the sound quality. We buy them because we like the design. If that’s what draws you to the urBeats3, more power to you, just don’t expect them to sound incredible or be the most durable. Now, say you’re set on wired earbuds but aren’t satisfied with these. We’ve compiled a list of the best earbuds to ease the research process. Designed for your life, urBeats3 wired earphones feature fine-tuned acoustic design to deliver an exceptional listening experience. Their optimal ergonomic fit provides all-day comfort while the tangle-free flat cable and magnetic earbuds offer easy portability, so you can stay on the go.